Kurt Busch won the pole at New Hampshire on Friday. “I don’t want to second-guess anything, so when the crew chief (Billy Scott) says ‘Go,’ you just go,” said Busch. “I like the way we made the right changes through each of the rounds, and we stuck to a game plan. Martin Truex Jr., the defending series champion, will start alongside Busch. Truex drove his Furniture Row Racing Toyota to a lap at 133.502 mph. Kyle Busch will start P3 while Joe Gibbs Racing teammate Denny Hamlin will start fourth. Fifth will be Ryan Blaney. 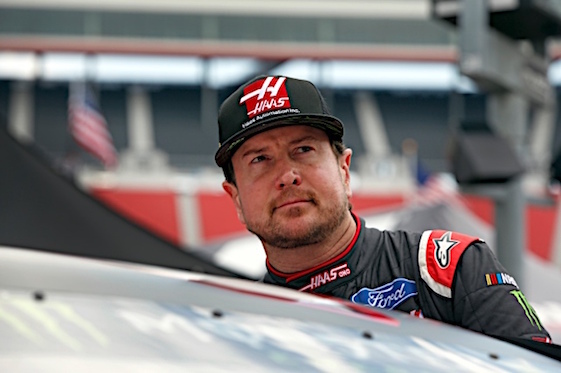 (41) Kurt Busch, Ford, 133.591 mph. (78) Martin Truex Jr., Toyota, 133.502 mph. (18) Kyle Busch, Toyota, 133.431 mph. (12) Ryan Blaney, Ford, 132.720 mph. (2) Brad Keselowski, Ford, 132.715 mph. (20) Erik Jones, Toyota, 132.674 mph. (88) Alex Bowman, Chevrolet, 132.618 mph. (19) Daniel Suarez, Toyota, 132.581 mph. (9) Chase Elliott, Chevrolet, 132.462 mph. (24) William Byron #, Chevrolet, 132.383 mph. (21) Paul Menard, Ford, 132.190 mph. (10) Aric Almirola, Ford, 132.586 mph. (4) Kevin Harvick, Ford, 132.554 mph. (14) Clint Bowyer, Ford, 132.402 mph. (47) AJ Allmendinger, Chevrolet, 132.379 mph. (3) Austin Dillon, Chevrolet, 132.259 mph. (31) Ryan Newman, Chevrolet, 132.200 mph. (22) Joey Logano, Ford, 132.094 mph. (42) Kyle Larson, Chevrolet, 132.039 mph. (48) Jimmie Johnson, Chevrolet, 131.925 mph. (17) Ricky Stenhouse Jr., Ford, 131.447 mph. (37) Chris Buescher, Chevrolet, 131.238 mph. (13) Ty Dillon, Chevrolet, 131.247 mph. (95) Kasey Kahne, Chevrolet, 130.954 mph. (43) Bubba Wallace #, Chevrolet, 130.860 mph. (32) Matt DiBenedetto, Ford, 130.783 mph. (34) Michael McDowell, Ford, 130.568 mph. (38) David Ragan, Ford, 130.532 mph. (6) Matt Kenseth, Ford, 130.483 mph. (15) Ross Chastain(i), Chevrolet, 129.213 mph. (72) Corey LaJoie, Chevrolet, 129.151 mph. (00) Landon Cassill, Chevrolet, 129.134 mph. (99) Kyle Weatherman, Chevrolet, 127.577 mph. (51) BJ McLeod(i), Chevrolet, 127.555 mph. (23) Blake Jones, Toyota, 124.556 mph.